When you want to reboot an established and beloved racing franchise, there are worse ideas than calling in a team that created different beloved racing franchise, which is exactly what EA did when it gave Criterion Games the responsibility of revitalizing Need For Speed. Criterion, which hit it big with the Burnout series, set out to "redesign and redefine" Need for Speed by reshaping it for the "connected generation" and giving longtime fans what they've always wanted: a badge. The number one most requested feature Need for Speed fans have been begging for over the past 7 years, says creative director Craig Sullivan, is the ability to play as the cops. The police have dropped into Need for Speed now and then many times, but have never had fully playable careers until Hot Pursuit, which allows you to follow full progressions on either side of the speeding ticket. You're not locked into one career or the other, though; you can hop between racers and chasers however you like. As you race, you earn "bounty" - basically the game's version of experience points - which advances your level and unlocks goodies like cars and events. The progression between on and offline play is integrated, so your effort is never wasted. Bounty is bounty is bounty, no matter how you earn it. Part of why Criterion was so excited about doing Hot Pursuit, says Hamish Young, the game's producer, is that they finally got to do real cars, and swanky ones at that. All of the cars featured in the game are high end exotics, even the ones driven by the police. Many of the models will be available for either career (though your paint scheme as a police officer is, naturally, somewhat limited) but some cars will be exclusive to one career or the other, which provides plenty of incentive to try both. I got the chance to try a small chase section of Hot Pursuit as the racer. The cop caught me pretty quickly, in part because I was enjoying driving through the long stretches of open road so much that I forgot I was actually trying to get away, and in part because the steering was incredibly touchy. The smallest flick of the stick and I was in the guardrail or skidding out of control, but it definitely felt like it would only take a few races to really get the feel of things. Your goal as the racer is to evade the police, but that doesn't necessarily mean you have to outrace them. If you're wily enough, you can use one of the tools the game provides to trick them. As you drive, your Heat level increases, slowly unlocking resources designed to give you an edge over your opposition. The racer's resources are defensive: a radar jammer, weapon jammer, overdrive, and decoy. If you're having trouble outrunning your pursuers, jam their radars, find a nice quiet spot off the side of the road to hide, and chuckle to yourself as they pass on by. If you're carrying a badge, you can use your road blocks, spike strips, aerial support, or EMP to bust a racer's groove and leave him dead in his tracks. If you even remotely competitive, you're going to have a love/hate relationship with Hot Pursuit's Autolog, which is a suite of connected features that allows players to "connect, compete, and compare themselves to their friends." Autolog keeps track of what your friends are doing and then recommends what you might want to do during that play session based on the results. If your pal has crushed your personal best time in a game mode or location, Autolog might suggest that you try and remedy that situation, or it may simply notice that your friends are all trying a certain event that you've yet to sample and suggest that you give it a try. The possibilities for smack talking, motivation, and payback is practically endless, but that's not to say that Hot Pursuit always has to be about antagonism. 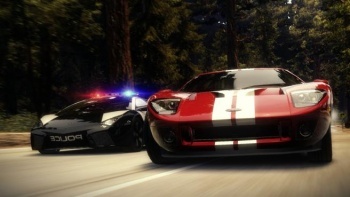 You can play with up to 7 other people online, in whatever ratio of cops and racers you choose. The tougher the chase, the more bounty you earn, so teamwork can be a worthwhile endeavor. Criterion knows a thing or two about making great racers, and their experience shows in Need For Speed: Hot Pursuit, which comes out for PS3, Xbox 360 and PC on November 16.